Corsair | Just Shooting Memories! Today, November 11, is Veterans Day in the United States. I would like to say thank you to all the men and women that have maintained the freedom that allow me to post what I want. Ever since I was little, I have always been amazed with flight. I loved to watch birds gliding through the air, not to mention watching airplanes and all other manner of flying things. It is so hard to believe that just adjusting the way air flows over something can pull it into up into the air. Even though they fly, airplanes are still heavy, so to see some of these large planes hanging from the ceiling is a feat. It makes me wonder if they have ever had any accidents here. 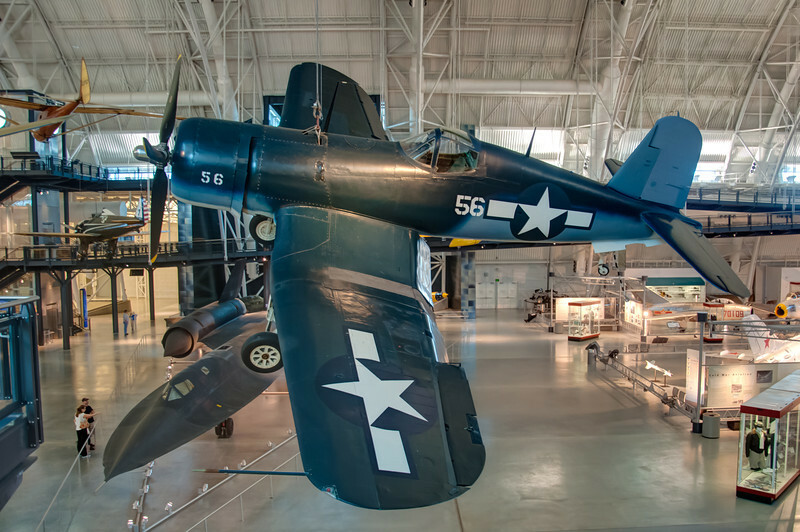 This photo is of a Vought F4U Corsair. What an amazing aircraft. The speed and agility of this fighter made it a major factor in WWII. You can find this and many other aircraft at the Smithsonian Air and Space Museum’s Udar-Hazy Center. Great shot. A little partial to the P51, but this is a great plane.